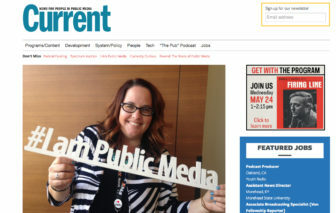 Advertising in Current: a win-win for public media and for you. 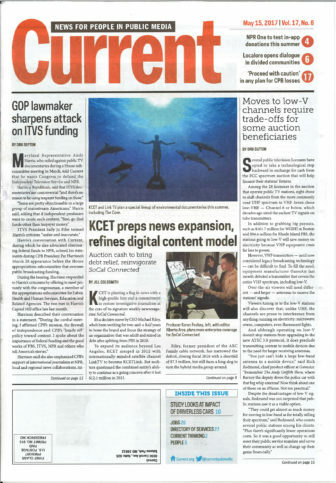 Current informs, connects and inspires the public media community. Your advertising in Current will reach key decision makers in public media, while enabling us to accomplish our mission. We love speaking directly with our advertisers! Call Kathy at 727.433.2527 or email her to discuss your marketing objectives or to place an ad in print, online, in our newsletter, or to discuss sponsored content. There’s no better way to reach public media’s decision-makers. Whether you’re a producer looking to boost your program carriage, a vendor or consultant working with public media organizations, or have a special meeting or conference you want to boost, there is no better place to advertise. Current newspaper and Current.org provide direct links to the people making public media happen. From the control room to the board room, professionals in public media tell us they rely on Current to stay on top of breaking news, policy, funding opportunities, best practices, conversation and commentary. Most public radio and television stations help their employees keep current through our Group Subscription Plan. Count the majority of local public media stations as well as most major related organizations among our readers, including: PBS, NPR, CPB, APTS, APT, PRI, APM, Greater Public and NETA, to name just a few. Add to that list independent producers, funders, board members and policy makers and you have the most comprehensive reach available. 32% of our readers are involved in content; 17% work in development.